Illustration de Joe Kubert pour la sortie des trois titres "howardiens" de Dark Horse. C'est de toute beauté! Mais qui sont ces trois titres? Written by Timothy Truman, penciled by Thomas Giorello and Richard Corben, colored by Jose Villarubia, covers by Joe Kubert and Frank Cho. As hard as it's been for Conan to return to Cimmeria, things aren't getting any easier as he nears his goal, and he quickly runs afoul of raiders on the Cimmerian borderlands. One stranger welcomes Conan home with a crack to the head, and another begins to weave a tale about Conan's grandfather -- another Cimmerian who was filled with wanderlust. 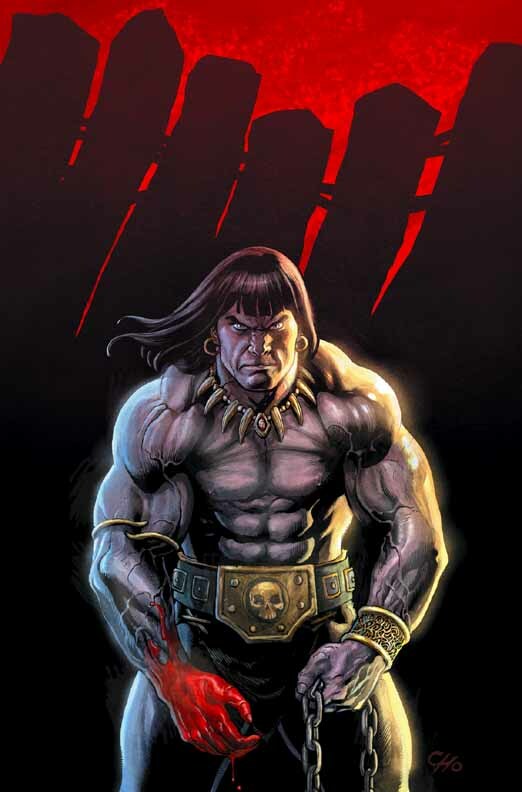 Conan the Cimmerian continues Dark Horse Comics' modern revitalization of Robert E. Howard's most beloved character. This is a great jumping-on point for new readers -- and a first look at the creative muscle that will fuel Conan's adventures throughout 2008! Written by Timothy Truman, penciled by Tomas Giorello and Richard Corben, colore by José Villarrubia, cover by Frank Cho. 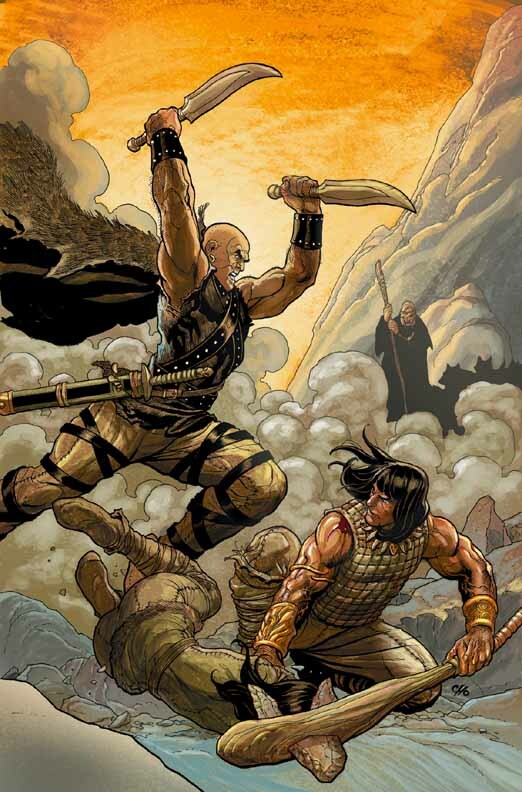 Dark Horse's exciting new Conan era continues with a second round of adventure! As Conan recovers from last issue's clash with raiders on the Cimmerian borderlands, a kind stranger shelters him and weaves a tale of Conan's grandfather, Connacht. As an older Cimmerian, Connacht inspired young Conan with tales of dazzling lands and beautiful women, but the story the snowbound stranger relates now is one of a brush with death and supernatural beasts--brought on after an act of selfless kindness. Is it true that "no good deed goes unpunished" . . . ? Written by Timothy Truman, penciled by Tomas Giorello and Richard Corben, colored by Jose Villarrubia, cover by Frank Cho. A young Cimmerian huntress--a character seen in Conan Vol. 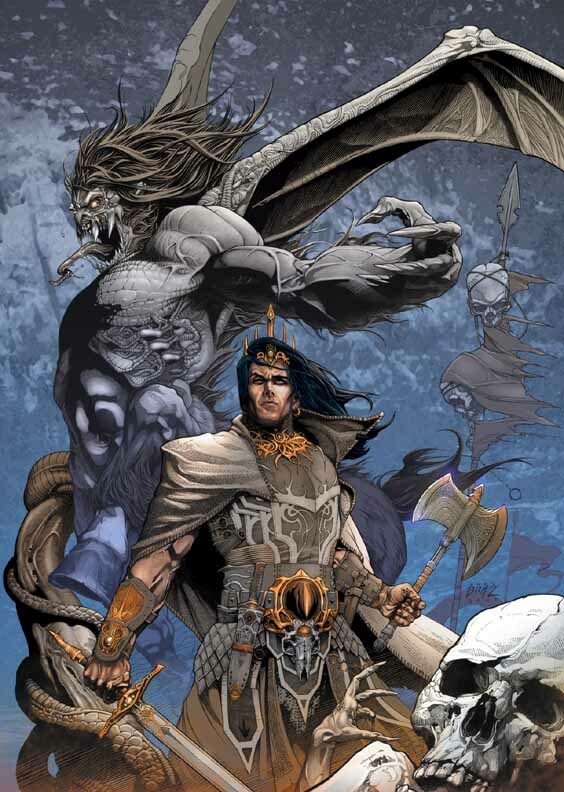 0: Born on the Battlefield--and Horsa--an Aesir leader from The Frost Giant's Daughter--both cross paths with Conan as he continues his dangerous trek through the snowy mountain passes of Cimmeria. Fighting his way through the natural dangers of his barbaric homeland has been a welcome change from the mind games and treachery Conan found in the cities of the East, but there's an unfortunate lesson in treachery in store for Conan here, too. In a Richard Corben flashback sequence, Connacht--Conan's grandfather--seems to have found a role for himself working in a busy city, but as the old saying goes, "Fleas will find a dog . . . and trouble will find a Cimmerian." Conan finds himself at odds with Horsa -- an Aesir leader last seen in "The Frost Giant's Daughter" -- when he tries to protect his former Cimmerian lover, Caollan, from Horsa's strange war party. Conan faces off against some strong Aesir soldiers, as well as the colorful-yet-foolhardy berserker Thorgeir and the powerful witch Olva. Being caught in the middle of a blood feud between Cimmerian and Aesir chiefs is bad enough, but things get much worse when Olva summons the demonic Skrae to hunt down Conan and his secretive ward. Richard Corben's flashback sequences‹featuring Conan's grandfather, Connacht -- take a surprising turn when they dovetail into the present for an exciting cliffhanger! A child that Conan's grandfather saved from death many years ago -- now an old man -- seeks to return the favor, but can he get to Conan and Caollan before Horsa's warriors capture their Cimmerian prey? And what good is an old man against Aesir soldiers and the vicious witch Olva? 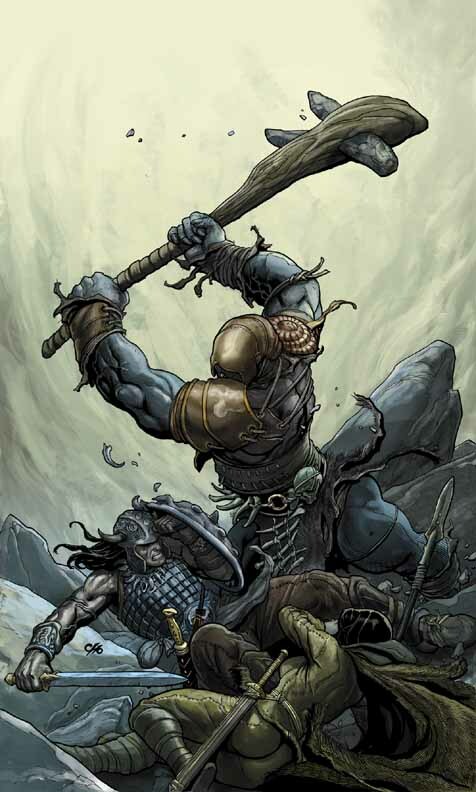 Thorgeir the Berserker gets his second round with Conan, and Caollan shows just how tough and wily a Cimmerian woman can be in battle -- even when outnumbered. 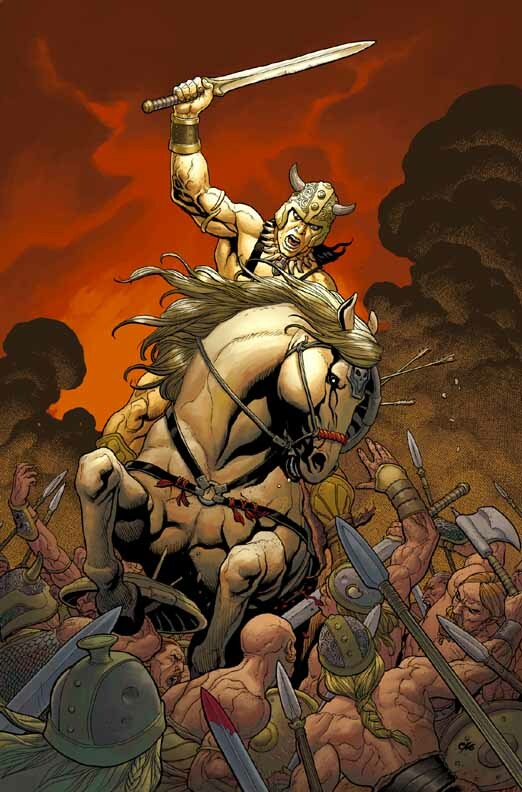 Richard Corben contributes stunning flashback scenes featuring Connacht, Conan's grandfather. In this issue, Corben brings us to a dark, seemingly hopeless time in the older Cimmerian's life, when he was betrayed and enslaved. Written by Scott Allie, penciled by Mario Guevara, colored by Dave Stewart, covers by John Cassaday and Joe Kubert. Written by Scott Allie, penciled by Mario Guevara, colored by Dave Stewart, cover by John Cassaday and Laura Martin. 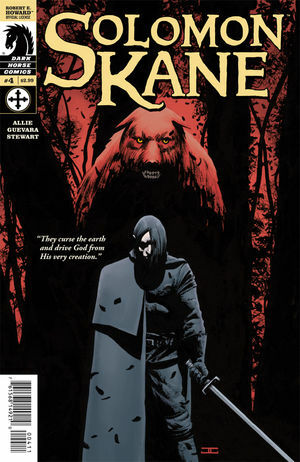 Mysteries emerge during Solomon Kane's stay in the Castle of the Devil -- the beasts that prey upon the local peasantry make their presence known, and another body is discovered. Kane begins to doubt the legends about the ancient chapel beneath the castle. Did a devil-worshiping monk really die there at the hands of his brothers, or was there something even more sinister afoot? And what lives down there now? Written by Scott Allie, penciled by Mario Guevara, colored by Dave Stewart, cover by John Cassaday. 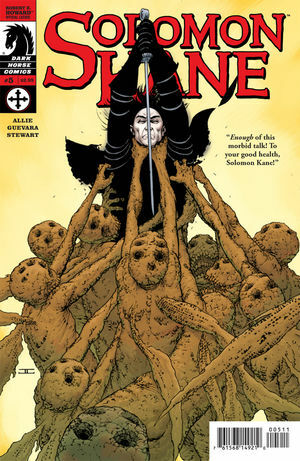 With more dead bodies discovered around the fabled Castle of the Devil, the determined Puritan adventurer Solomon Kane and his new ally John Silent look for answers in a pile of ancient bones buried deep in the abbey beneath Baron von Staler's fortress. 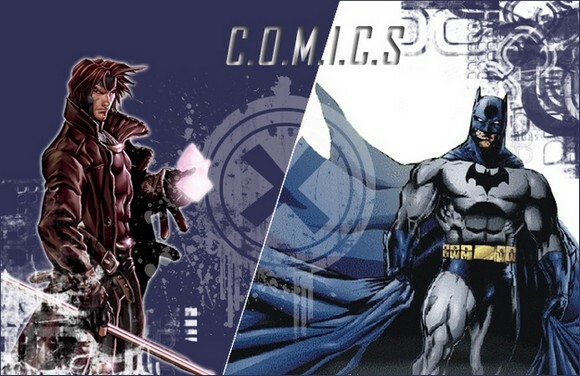 The Baroness is missing, and the Baron accuses Solomon Kane. Tempers flare, and blades are drawn -- but the real monster remains unseen. Après Conan voici la seconde licence de Howard que Dark Horse publie: Solomon Kane! Rapide présentation du personnage: armé d'une épée et de deux pistolets, Solomon Kane traque le Mal sous toutes ses formes avec une obstination proche du fanatisme religieux, n'hésitant pas à tuer ses cibles à qui il reproche souvent le meurtre. Taciturne, solitaire et fuyant il est l'antithèse de Conan de ce côté-là mais a lui aussi le gout du combat. Les éditions Bragelonne qui publie en ce moment l'intégrale des récits de Conan par Howard devraient aussi sortir prochainement un recueil des aventures de ce personnage, de même qu'un film dont j'ai parlé en section ciné devrait sortir prochainement. 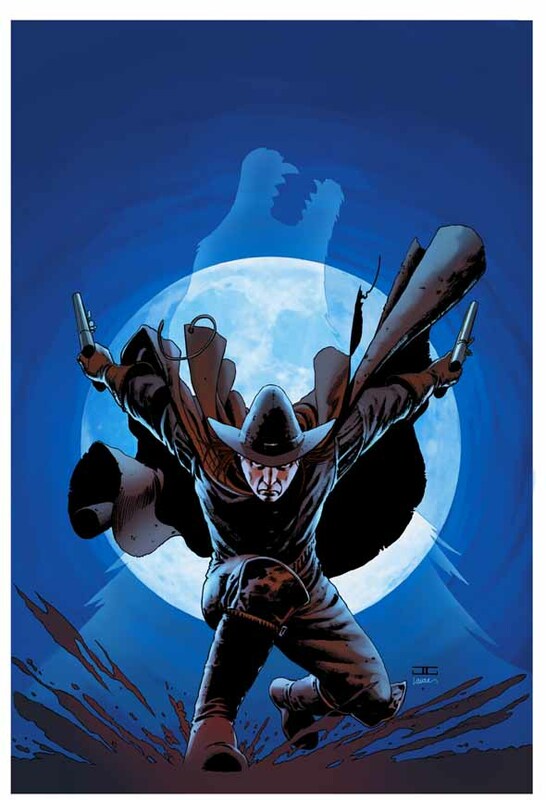 Solomon Kane a eu les honneurs d'être adapté par Marvel en comics, apparaissant dans plusieurs comics, souvent sous la houlette de Roy Thomas, toujours là pour adapter du Howard. Cette nouvelle version fera comme pour Conan fi des précédentes adaptations et débutera par l'adaptation de "The Castle of Evil", une histoire que Howard n'a visiblement jamais finalisée. Written by Arvid Nelson, penciled by Will Conrad, colored by Jose Villarrubia, covers by Andy Brase and Joe Kubert. 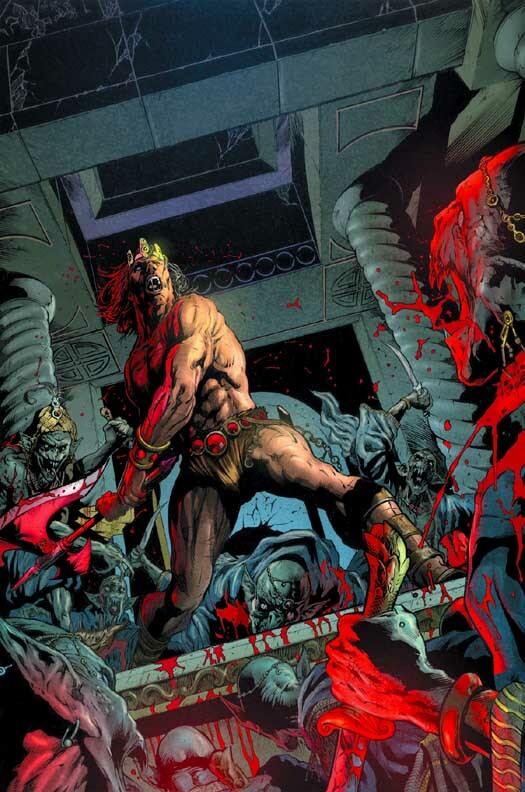 More comfortable with a sword than a scepter, Kull has recently crowned himself king and seeks to unite the once-proud and powerful land of Valusia. Only Count Areyas stands between Kull and a reunified kingdom -- and the obstinate Count waits patiently in his Iron Fortress, the land's oldest and most formidable castle. Horrors lurk in the shadows of Kull's newly won throne, and slithering foes stalk his every move. Troisième personnage issue de l'imagination de Howard chez Dark Horse, Kull commencera ses aventures chez cet éditeur en novembre. Roi d'Atlantis, il évolue dans le même monde que Conan mais plusieurs millénaires, les ressemblances entre les deux personnages sont multiples et pour cause: Howard a créé Kull en premier et s'en est inspiré par la suite pour créer Conan, dont la première aventure était à la base destiné à Kull. Ce genre de chose arrivera souvent, par exemple Thulsa Doom, le méchant du premier film Conan est un ennemi de Kull, et le téléfilm Kull avec Kevin Sorbo (plus connu pour avoir joué Hercules dans la série des 90's) dans la rôle-titre est inspiré de l'aventure de Conan intitulée "L'Heure du Dragon" (à la base le téléfilm devait être sur Conan). Comme la plupart des autres créations de Howard, Kull est apparu chez Marvel, on a pu lire ses aventures dans Savage Sword of Conan. 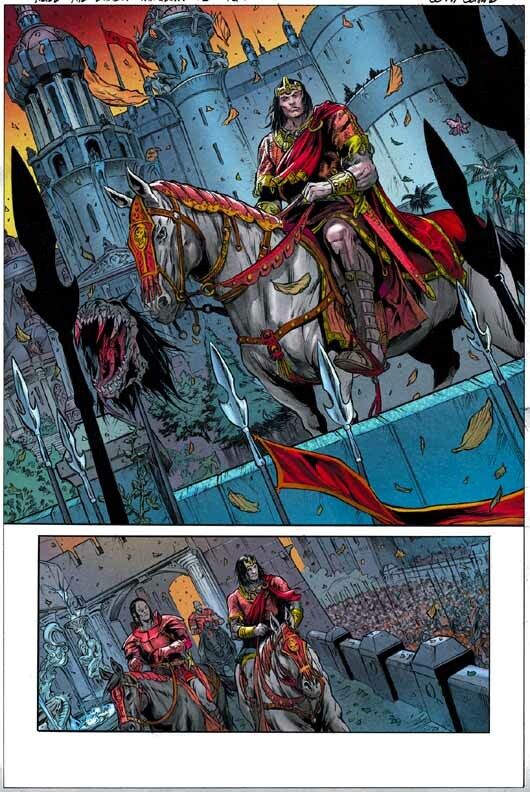 Comme pour Conan et Solomon Kane cette nouvelle version ne tiendra pas compte de ces comics et réinterprétera les histoires de Howard, la première nouvelle adaptée sera The Shadow Kingdom. Ce sujet parlera de ces séries mais aussi des autres oeuvres de Howard que Dark Horse pourrait publier à l'avenir. Excellente présentation des séries issues de l'esprit de R. E. Howard et éditées chez Dark Horse. Conan The Barbarian est en cours d'édition en album, toujours chez DH. Ils sont complétés par des dessins préparatoires et autres joyeusetés pour les fans. 7 albums (soft et HC) sont actuellement en vente. 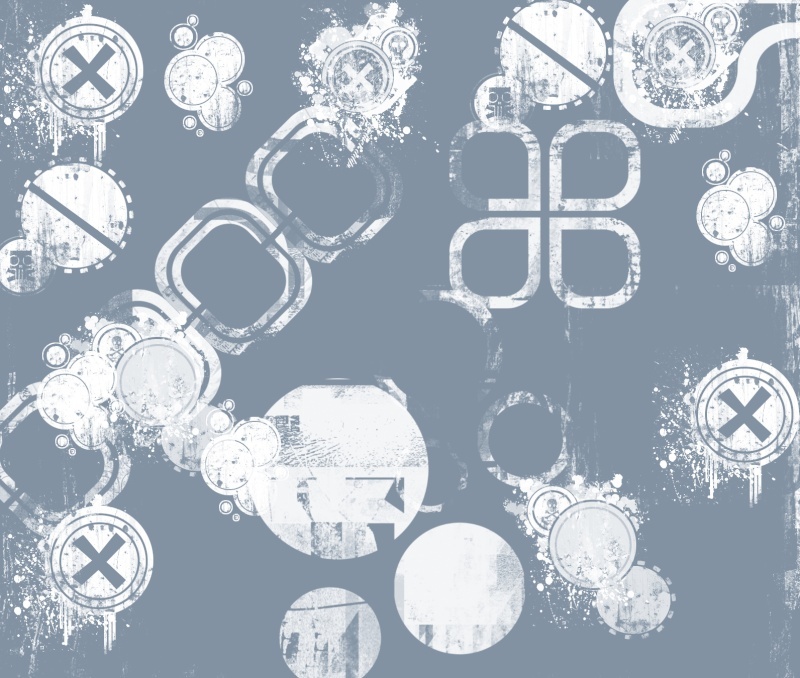 À ne surtout pas manquer, l'incroyable album #0, "Born on the battlefield". 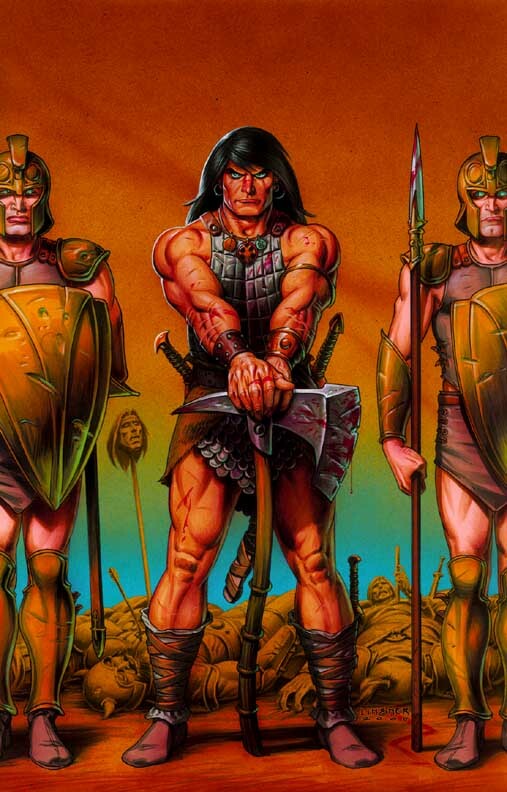 Une richesse visuelle et scénaristique incroyable sur la naissance de Conan et ses premières années dans le clan. Rarement un éditeur a eu le cran de revoir intégralement l'esprit, l'univers d'un personnage de roman. Nous avons là, une vision moderne et adulte de Conan. Le Conan que nous avions tous en tête lorsque nous lisions ses aventures dans des bouquins de poches avec leur fabuleuse couverture de Frazetta et consorts. Ne connaissant pas Solomon Kane et ayant vaguement aperçu certaines histoires de Kull chez Marvel, je suis heureux de voir que Dark Horse les édite. J'ai eu en main le #1 de Solomon Kane (cov de Kubert ! La chance !) et j'en suis tombé à la renverse ! Un comic profond, noir, froid mais vivant par ses dessins et ses couleurs, par la qualité de son scénario... Un vrai régal ! J'attends Kull avec la même impatience et curiosité ! Donc, vous pouvez y aller, c'est du très, très bon comic pour adulte ! Written by Timothy Truman, penciled by Tomas Giorello and Richard Corben, colored by Jose Villarrbuia, cover by Frank Cho. 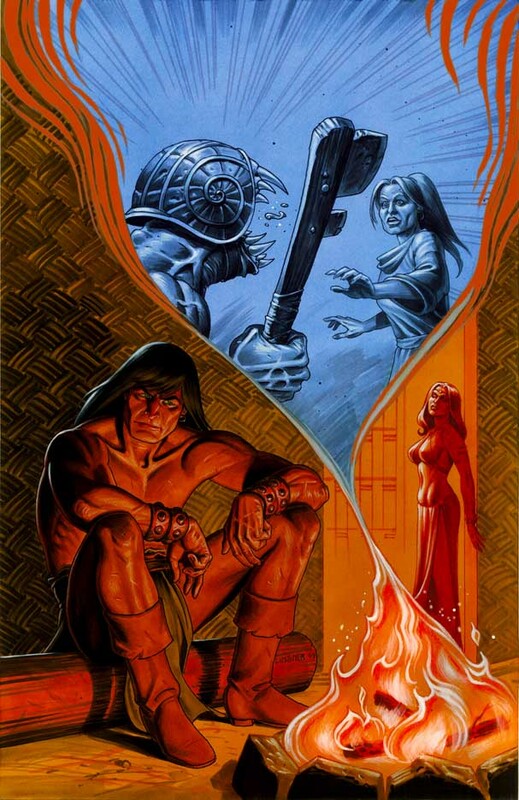 Richard Corben illustrates another gripping Connacht flashback, as we witness how Conan's grandfather returned to Cimmeria, found a bride, and tamed his wanderlust in order to become an integral part of his tribe. In Conan's present, Conan has overcome impossible odds and trials to return to the Cimmerian village he grew up in -- only to find that much has changed in the years he's been away. With Brecan and his men closing in on the fugitive Caollan, will Conan's reunion with his former Cimmerian lover get cut short? Tim Truman's "Cimmeria" story arc comes to an explosive finale and tribal politics come to a head, as the fate of Conan's new lover is decided! Conan learns the truth about why his grandfather stayed in Cimmeria -- where the old warrior became a vital member of his adopted village, yet never let go of his daydreams and wanderlust. Brecan seeks to impress his chieftain father and end current clan tensions and disputes, but his "solution" creates even more problems and puts him at odds with an enraged Conan. Everything ties together here, as the first Conan the Cimmerian arc crescendos into a flurry of swords and emotion! Written by Arvid Nelson, penciled by Will Conrad, colored by Jose Villarrubia, cover by Andy Brase. Written by Arvid Nelson, penciled by Will Conrad, colored by Jose Villarrubia and cover by Andy Brase. With Pict leader Ka-Nu's ominous warning still ringing in his ears, Kull must confront a more immediate crisis -- the wrath of his first wife, the Lady Igraine, whose venomous tongue threatens the validity of his claim to the throne. If that weren't enough, Kull must still meet with Brule, the formidable-yet-contentious Pict warrior whose insights will lead to a horrific revelation. An action-filled frenzy! 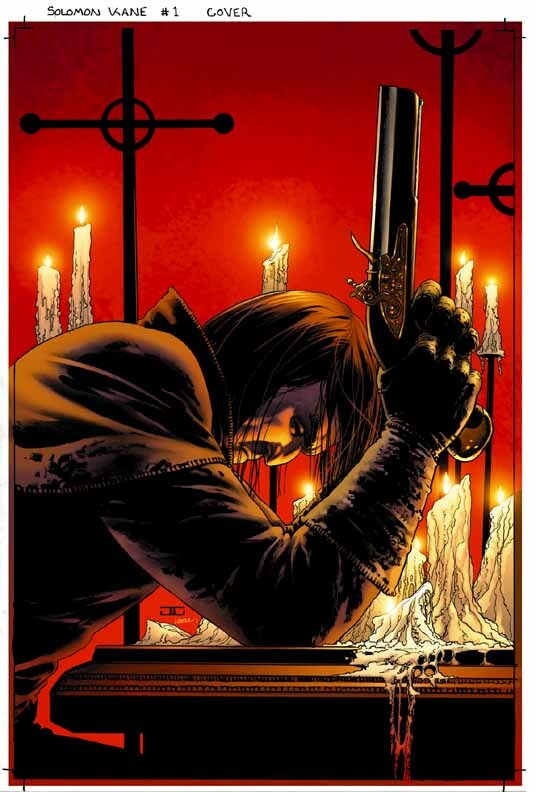 With his host wounded -- and bodies piling up in both the Black Forest and the Castle of the Devil -- Solomon Kane tries to keep himself and his deceptively simple companion, John Silent, from quick deaths on the gallows. The lovely, scheming Mahasti is missing, supernatural horrors lurk in the forest, and Baron von Staler becomes a bit unhinged. Expanding upon Robert E. Howard's unfinished "Castle of the Devil" story. The Castle of the Devil hides several secrets -- the most horrible of which may still be locked at the base of the castle in the ruins of an ancient abbey. 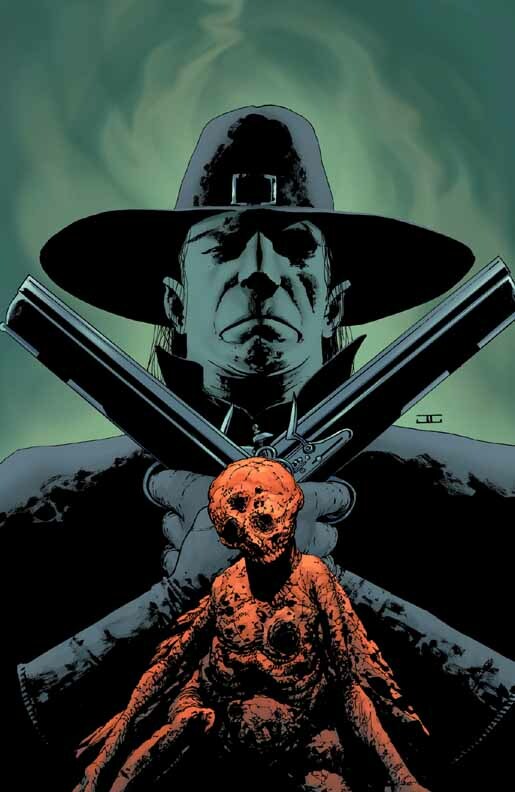 Solomon Kane gets closer to unveiling the truth behind the crazed monks who used to live there, as he deals with the castle's current batch of strange inhabitants. Escaping with John Silent, his wounded companion, is out of the question, because Kane also seeks justice for the souls of innocent children who were killed on the gallows that litter this evil, tainted region of Germany's Black Forest. A new story arc! Conan leaves his trials and regrets behind in Cimmeria and heads into the next phase of his adventurous life -- his mercenary career. Timothy Truman adapts Robert E. Howard's powerful "Black Colossus" short story and sets Conan off on what will be his bloodiest battle yet, when the mercenaries of Amalric clash with the demonic hordes of Natohk! Conan, once a wandering thief, tries his luck as a professional soldier, joining Amalric's forces and facing condescending jabs from the noblemen in his company, who mistakenly think that the Cimmerian is an unskilled simpleton. Tomás Giorello takes on full penciling duties once again, and Joseph Michael Linsner returns as cover artist for this exciting arc! Written by Arvid Nelson, penciled by Will Conrad, colored by Jose Villarrubia. 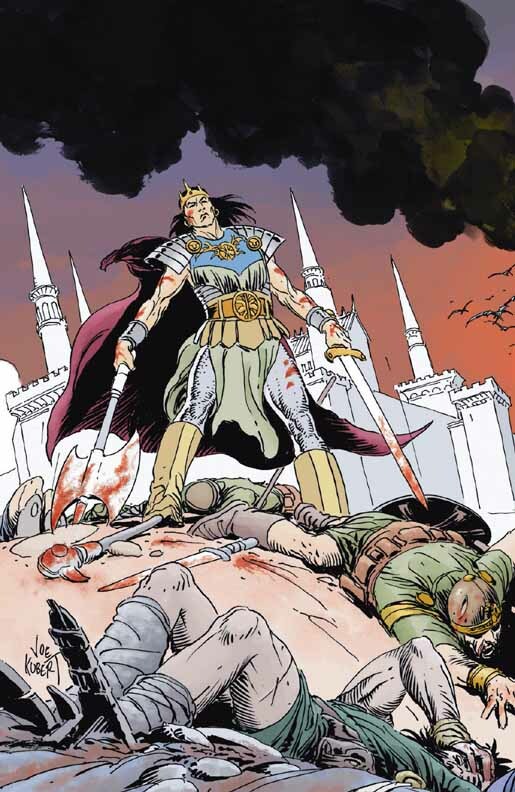 Dark Horse's riveting adaptation of Robert E. Howard's "The Shadow Kingdom" comes to a bloody crescendo, as Kull and Brule uncover further layers of deception and treachery in the ancient halls of Valusia's Tower of Splendor. Over the centuries, the human race has become confident of its complete dominance over the natural and supernatural realms. Using humanity's own arrogance and indolence against itself, a shadowy race of snake creatures has returned to nearly full strength -- and is poised to take over Valusia as a first step in toppling man's soft civilization! 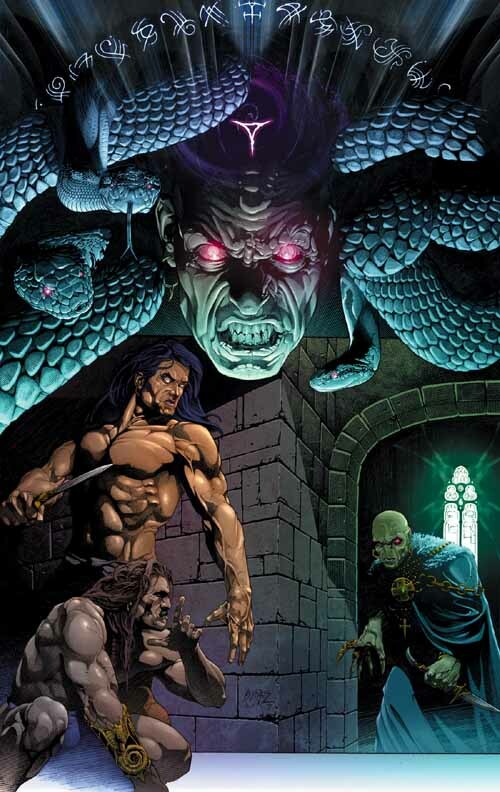 Kull, the newly crowned warrior-king, and Brule, a Pict emissary, are all that stand between the snake-men and the decimation of the Seven Empires. Ancient rivalries are put aside as Kull and Brule fight for their lives, their people, and their very souls! Written by Timothy Truman and Ben Truman, art by Timothy Truman and Joe Kubert, cover by Joseph Michael Linsner. 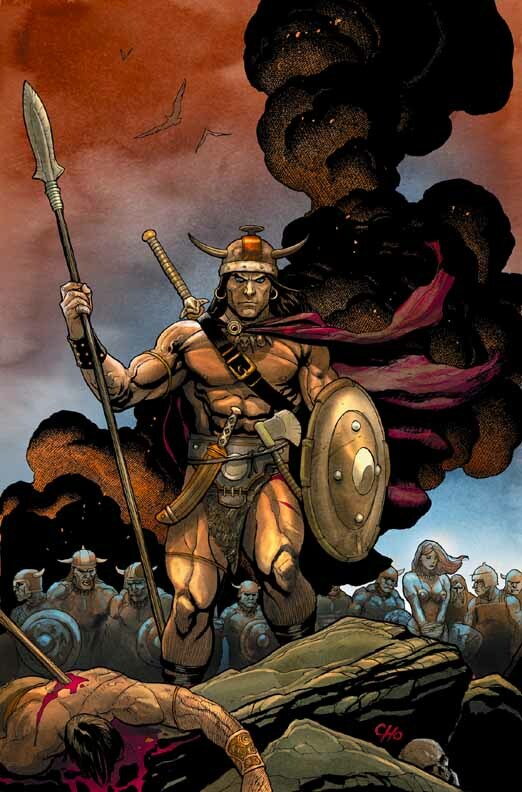 After Conan left Cimmeria and entered into a successful career as a brutal mercenary, he became the leader of Princess Yasmela's Khorajan army. In the calm after a successful campaign, Conan quickly tires of his pampered life as the princess's protector and lover. While Joe Kubert shows readers what trouble a restless barbarian can get into on royal palace grounds, Tim Truman takes readers back to the Cimmerian village of Conan's youth -- where a surviving Skrae creature claws its way toward Fialla, Conan's mother. Une information à prendre avec des pincettes en cette fin de soirée. Le site Bleeding Cool rapporte que Dark Horse annoncera probablement une nouvelle équipe créative pour Conan à la New-York Comic Con dans 10 jours. Et pas n'importe quel équipe. Brian Wood et Becky Cloonan ont déjà collaboré sur la série Demo en 2003. Le scénariste plus connu grâce à DMZ est sur le point de mettre un terme à Northlanders chez Vertigo, une saga sur les viking. Il resterait ainsi dans la même veine et passera de guerriers à un cimmérien barbare. On espère que la rumeur se confirmera car cela promet une vision de Conan originale.